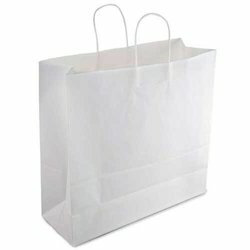 We are a leading Exporter of paper bag from Mumbai, India. The position of the bag, valve and bag bottoms as always seen from the bag face – is always to be indicated in the order. The bag face is the printed side, the back is the side with the longitudinal glued seam and dimension for the empty glued paper valve. bags can be of the stepped-end type or flush cut type and also with the option of having one end open for special filling methods. For both ends pasted, the valve for filling may be various types. Bag length 18 - 129 cms. Bag width 9 - 72 cms. Bag bottom & top 5. 5 - 23 cms. Looking for Empty Paper Bag ?